Watch highlights from Corey Gault's second season in the VFL from matches against North Ballarat and the Northern Blues. Watch highlights from Corey Gault's second season in the VFL from matches against North Ballarat and the Northern Blues. Corey Gault has been added to Collingwood's rookie list for the 2014 season. Corey Gault has returned to Collingwood’s list for 2014 after the club re-selected him in Wednesday’s Rookie Draft. The versatile 21-year-old was on the club’s senior list in 2012 and 2013 but was delisted as a part of the its second list lodgement on 14 November. He continued to train with the Magpies in the weeks leading up to the drafts and formally returned when he was chosen with selection No. 10 in the Rookie Draft. Gault was Collingwood’s only selection in the Rookie Draft. “Corey’s a contracted player to us. It was important that we fulfilled that commitment,” General Manager of List Management Derek Hine told collingwoodfc.com.au. “We took Corey off the senior list in the knowledge that we could potentially have one or two extra selections, if the opportunity presented itself, which it did. Gault played 27 VFL games for the Magpies in his two seasons on the senior list including 14 this year. He averaged 11.4 disposals and 3.8 marks per game in 2013, spending time as a key position player at both ends of the ground as well as taking occasional spells in the ruck. A groin injury late in the season halted his progress and meant that he missed the Elimination Final loss to Port Melbourne. Gault originally arrived at the club with selection No. 65 in the 2011 National Draft. Hailing from West Australian club Swan Districts, Gault has only recently developed into a key position after experiencing a sudden growth spurt late in his teenage years. 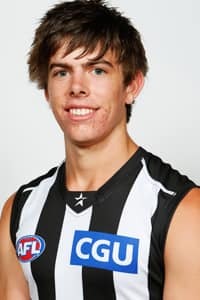 He represented Western Australia at the National Under 18 Championships in 2011 and averaged 22 hitouts, 17.4 disposals and 3.4 tackles while playing for the Swan Districts Colts.